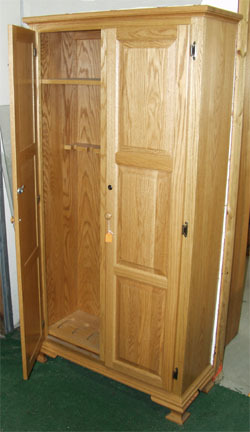 Hunters and gun collectors - have a look at our Amish made solid oak gun cabinet. The perfect addition to your office, den, rec room, or wherever else people keep their gun cabinets, this one is built by Amish craftsmen of solid oak with a solid oak veneer back. It features locking raised panel doors, one shelf at the top and room to properly support 8 guns inside - an excellent way to safely store your guns when not in use, and keep them away from curious children. Want to see more? Then click the handy link at the bottom of the page for a photo of the inside with both doors open.